Signals that require amplification, filtering, and isolation are pre-processed though signal conditioners prior to being digitized by a PowerLab DAQ. We provide high quality signal conditioning equipment for processing pulse signals, ECG, EMG, telemetry and biopotential signals and a range of other physiological research applications. 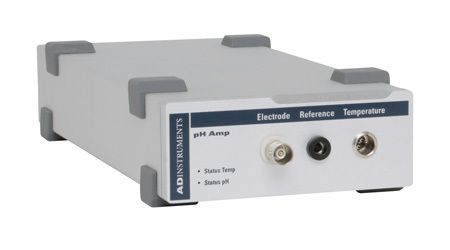 ADInstruments Bridge Amps are single-channel or multi-channel, non-isolated bridge amplifiers designed to allow the PowerLab to connect to most DC bridge transducers. Software-controlled, constant-current stimulators designed to work with a PowerLab (purchased separately) for direct or field stimulation of in vitro tissue samples. Additionally, the isolated stimulator option can also be used for in vivo animal and human studies involving nerve and muscle stimulation. The Spirometer is a precision differential pressure transducer for measurements of respiration flow rates. ADInstruments provides spirometry machines, kits, and parts for a range of respiratory experiments. Galvanically isolated, high-performance differential biological amplifiers optimized for measuring a wide variety of biological signals such as ECG / EKG, EMG, EOG, and EEG, with high-quality noise specifications and a range of filter settings. The EOG Pod utilizes the steady corneal-retinal potential in the detection of eye movement and position. The pod can also be used for EEG or EGG recordings. The Neuro Amp EX is a front-end device that extends the capabilities of the PowerLab system to record nerve activity using the microneurographic technique. As a low noise and high gain device, it is ideal for all recording environments requiring a wide bandwidth (100 Hz to 5 kHz) and a high signal to noise ratio.